Is there such a thing....is this possible ...I who more then once has been accused of being one of these would like to know ? Last edited by markzorb on Fri Oct 22, 2010 7:54 pm, edited 2 times in total. You mean all of us ignorant human beings, especially those pretending they are not? The measurement of how well you conform is human socially established method of gauging. Unless all Wingmakers are identical, then there must be those that dissent on some things. This behavior could be considered renegade. Answering my own question the answer is yes...and the proof of the pudding is here as a number that did incarnate to be hosts for Wingmaker Monads have been distracted and gotten lost in their egos...confusing that aspect of self for the True..the Monad which now is calling all those that signed contracts pre physical incarnation to honor this oath...shall be interesting how this resonates here as a number of you know this so...one hint if you are now receiving electric like currents to your right foot you have a contract and this is your wake up call. Yes…… there is certainly “role playing” going on here. “Bounty Hunters”….”Renegades”……..these are all labels that make no difference. The WM Material and the philosophies are what should be focused on…….be this. “Self Proclamation” is a statement onto itself and the need for it shows something that is almost always opposite of what is being proclaimed. Most see it for what it is and that is why it may not even require comment. Individuals who declare themselves an individuated consciousness, not merely a human personality, are immediately more connected to the voice of the Remnant Imprint. This simple act can rekindle the embedded program within the individuated consciousness and spark a new wisdom path. There is an unimaginable shortage of media that speaks to this aspect of the human consciousness and supports this program to emerge and express itself. 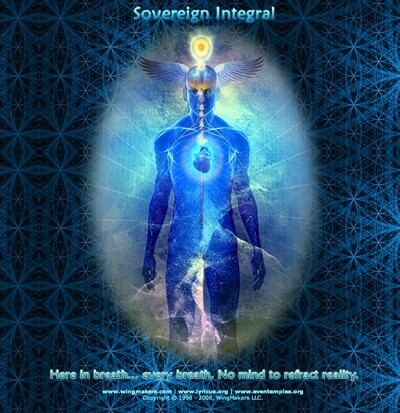 Individulated consciousness expresses itself via the Sovereign Integral state of consciousness...so they are essentially the same thing...To recognize and declare one's true identity is part of discovering and expressing one's personal wisdom ... anything else is a lie...or reveals they are stuck in the illusion. No one can do it for you...and "self-recognition" is needed. Declaring oneself a Monad or a Spiritual Bounty Hunter...is another thing...and means nothing to me (maybe Leibzig knows) in relation to the WMMs...and sounds pretty self centered....and disconnected from the Unification's plan...and in itself, is very revealing. First Source is always in control. Points A and Z are already defined. We are free to move about. One could argue that while you can do one thing (mindlessly) first source has a way, "of turning the selfish intent of one to the noble contributions of the many." God always does. I stick by the old saying "when life gives you lemons, make lemonaid." That is what first source does. Perhaps Anu/Lucifer are or were renegades ? Atleast by script anyway . Wow....had almost forgotten this topic which was posted by me over 4 years ago when I came here with an agenda having not read any of the WMM- or looked at any of the artwork or listened to any of the music.....thinking I knew it all having been a member /participant /student on Athena's forum that went out of its way to badmouth James and company....a past iam not proud of....but it shows how in my case actually getting involved with the WMM has changed me.........interesting you bringing this up MV.....as it sort of parallels what is going on right now on the forum with Featherlite.....and allows me to edit the subject by adding not true.......as I do not think a Wing Maker is by nature capable of not being anything less then One with First Source.....Anu is the renegade and he and his followers......of which i now view Athena and her Coven as.....are anything but......but they sure spent a lot of time trying to make me feel bad about myself by telling me I was one.....thanks MV for the opportunity to change thoughts from the past.......something perhaps we who came here with agendas need to do more of. I found this reference to what we could consider a renegade Wingmaker . Lucifer to be exact as stated below was a very devoted servant to The Central Race . I wonder if Anu and Lucifer are one and the same ? Dr. Neruda: "Because the Animus are not connected to the unification force." Sarah: "Why? I thought you said everything was." Dr. Neruda: "The formless consciousness doesn't select soul carriers that don't utilize DNA as its formative structure. It knows that these structures are not able to connect to the unification force, and therefore, cannot be trusted." Sarah: "And they can't be trusted because?" Dr. Neruda: "Because the unification force is what brings coherence to incoherence, and purpose to chaos. Without it, physical structures tend to ebb and flow in stasis, which is to say, they don't transform." Sarah: "How did this happen?" Sarah: "That the Animus became an independent race unconnected to God?" Dr. Neruda: "You've heard the story of the fallen angels?" Sarah: "You're talking about the Lucifer rebellion?" Dr. Neruda: "This story is misrepresented in Biblical texts, owing to the fact that the authors of these texts didn't have a sufficient understanding in which to define cosmology or physics. "The Central Race designed the higher life forms, and this includes a wide range of beings that operate within the quantum world and the reality membranes therein. Among these beings are what we commonly refer to as the angels, who are intermediaries between the soul carriers of humanoids, and the Central Race. "There were some within the angelic realm that believed the Central Race was too controlling of the soul carrier structure. They felt that a structure should be created that would enable angels to incarnate within the reality membrane of earth and other life-bearing planets. They insisted that this would improve these planets and the physical structure of the universe at large. However, the Central Race refused this proposal and a renegade group left to design a soul carrier, independent of the Central Race." Sarah: "Hold on a moment. You're saying that Lucifer led this rebellion to create a soul carrier that could house the spirit of an angel, and the Animus is the result?" Dr. Neruda: "It's more complicated than that. Lucifer, or what we have come to call Lucifer, was a very devoted servant of the Central Race. He was one of the forerunners of the angelic species; capable of powers that were diminished by the Central Race in subsequent prototypes." Dr. Neruda interview three . Sarah: "Are you saying that angels are created -- that they can't reproduce like humans?" "Lucifer's personality included a strong sense of independence from his creators, and an even stronger sense that his creators were flawed because of their insistence that the humanoid soul carrier would exclusively house the formless consciousness, and not the angelic form. To Lucifer, this seemed unthinkable because the angelic form was superior in its capabilities and could be of great assistance to the physical life forms on earth and other life-bearing planets. "From Lucifer's perspective, humans and the higher order species would be unable to transform themselves because of the severe limits of their soul carriers, or physical forms. Lucifer felt certain that without the collaboration of the angels, humanoids throughout the universe would become increasingly separated from their purpose as spiritual beings, and throw the universe into disarray, which would eventually cause its destruction and life within it -- including, of course, angels." Sarah: "Then you're suggesting that the Lucifer rebellion was simply a disagreement over this one issue?" Dr. Neruda: "Lucifer wanted to incarnate into this reality membrane the same way humans do. He wanted to become a collaborator with humanity to assure its ascension. While the Central Race saw his intentions as noble, they feared that the angelic incarnations would become known as Gods to their human counterparts, and unintentionally mislead humans, rather than co-create the ladder to the God state. "This matter underwent a tremendous debate, ultimately forming a division between the angelic realm and the Central Race. The loyalists to the Central Race argued that Lucifer and his sympathizers should be banished for their radical ideas that could potentially create a lasting division in their reality membrane, and cause them tremendous turmoil. Lucifer, in wide-ranging deliberations with the Central Race, negotiated a compromise that enabled him to take his group of sympathizers and prove the value of their plan on a single planet." Sarah: "Are you saying that Lucifer was allowed to experiment on a planet?" Sarah: "Okay, before we go any further, are you talking about this in the context of myth or are you essentially representing the Corteum view?" Dr. Neruda: "There are three ancient manuscripts in the ACIO's possession that describe this story in an allegorical form, but the Corteum view -- as you put it -- is much more descriptive and definitive as a record of this cosmic event." Sarah: "So, Lucifer conducted this -- experiment. Where and to what result?" Dr. Neruda: "The planet is in a galaxy known as M51 to your scientists." Sarah: "This is the same galaxy of the Animus?" Sarah: "So you're really saying that Lucifer and his band of sympathizers created the Animus to be soul carriers for angels?" Dr. Neruda: "It's more complicated than that." Sarah: "I certainly hope so because this story is too strange for me to believe." Dr. Neruda: "Be patient. We're moving into uncomfortable territory for most people. So take a deep breath and bear with me as I try to explain this. "Lucifer created a synthetic physical structure that could accommodate the quantum requirements of an angel. It was a very effective structure, but induced a strong survival complex within the species, which eventually overpowered the angelic tendency of altruism and cooperation." Dr. Neruda: "When the formless consciousness enters a reality membrane through a structure like a soul carrier, it immediately feels disconnected from all other forces, but its own. It's literally thrown into separation. In humans, this is more or less controlled through the subtle realization that it remains connected through the unification force, and this is because its DNA is designed to emit this feeling of connection subconsciously. "However, in the case of the soul carrier designed by Lucifer and his followers, this connection was severed both consciously and subconsciously because the structure was not based on DNA, which is strictly controlled by the Central Race. Consequently, it inclined this experimental species toward a very strong survival complex because it feared extinction so deeply, which is the result of feeling complete separation from the unification force. This survival complex created a species that over-compensated its fear of extinction by developing a very powerful group mind. "The group mind compensated for the loss of connection to the unification force, creating its physical and mental corollary. It was the equivalent of unifying the species as a whole in the physical reality membrane of their planetary system. Thus, the angels that entered this system lost their memory of their angelic natures and became more interested in operating as a single collective, than as individuals. "They became a concern for the Central Race, and Lucifer was asked to dismantle his experiment. However, Lucifer had become attached to the specie that he had helped to create. These angelic beings had developed over a number of generations a very sophisticated set of technologies, culture, and social order. It was like an extended family in many ways to Lucifer. So, he negotiated to modify his creation so they would no longer accommodate the angelic frequency or quantum structure, but that they could become self-animated." Last edited by Multiversal on Sun Oct 24, 2010 12:30 pm, edited 1 time in total. I have often heard the the Angelic Beings have been envious of Human Beings . Yet it is so funny , because humans want to be Angelic and Angels want to be Human . What a paradox ? Neither have I . Angels would never survive on this planet. It requires much more than being politically correct and "nice". Earl Grey tea anyone? I like mine hot and with honey, lukewarm or tepid water can simply ruin a good cup of tea. Well I'm from the south and I like my tea cold and sweet .